I’ve talked here a few times (here and here) about how Microsoft doesn’t seem to be able to catch a break. Google or Apple get gushing reviews for living ‘in beta’, Microsoft gets slammed for getting stuff out too soon. Apple’s security is questionable, but we never hear about that. Nor it seems are we ever reminded of the potentially dangerous level of detail Google extracts from customers. Ballmer’s an egotistical wild man, while Jobs is a quirky eccentric genius. Making huge profits turns Microsoft into the evil empire, but is seen as a validation of Google’s all round wonderfulness. This year’s Mix event, which finished yesterday has been a strong reminder that in fact, there is a good deal of great stuff going on at the software giant, and that developers in particular are delighted with much of the company’s output. Friday’s presentation on the design of Office 2007 provides a fascinating insight into the sheer scale of the software and interface engineering challenged the team faced, their tenacity in dealing with it, and the powerful role place on the needs of the end user. Including early prototypes showing hugely varied ideas which the team went through to get to the version that has been released, the presentation is rich with insights into the internal battles that had to be fought throughout the process and some amusing asides to previous mistakes, the presentation (75m) is well worth a watch. Jensen Harris looks all the way to Office 1, documenting the slow decent into the chaos of Office 2003 which boasted 31 menus and 19 taskpanes. The impetus to redesign the interface from the ground up for Office 2007 rather than more menus, wizzards and taskpanes, was an understanding that the user must feel in control of their document and that – while all the features should stay, the ‘perception of bloatedness’ had to be removed. We see some of the stats from the customer improvement programme (collecting millions of anonymous customer usage patterns). This information was a key part of understand the sequence of actions that real customers actually take, and reveals – perhaps unsurprisingly – how erratic their actions actually are. There is also some amusing eye tracking against the 2003 site, some interesting insights into the challenges of creating a taxonomy of the 1500 functions, and some more unkind words about the demise of clippy, the automated assistant which was just one way to get around the almost impossible interface that existed until recently. During the Q&A at the end of the session, Harris is asked about the extent to which customisation was considered. Whilst not against customisation per se, Harris argues that it mustn’t be used as a ‘crutch’, avoiding usability problems by allowing the user to remove them, and explains that only 2% of users ever used the customisation features of 2003, and then only for one or two buttons. 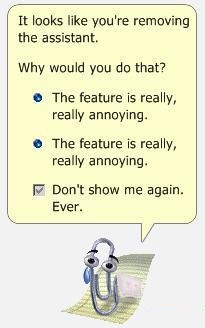 A little bit of history about Clippy, and a link to some more information..
A lot of money was invested in clippy development. Warning – People are named! (Check the link for the history).